If you haven’t downloaded the beta version of Morfik 3 you should stop wasting your time. Morfik 3 introduces a new page templates feature which let you easily create reusable layouts and basic page configurations. This is really useful in getting started with a new project as you will be able to reuse layouts and parts of your application design that you might have already created in a previous project and saved into a template. It is even more useful is that now that you can create pages that are specific to the iPhone and for general computers withing the same application and have the Morfik Framework automatically serve out the correct ones. 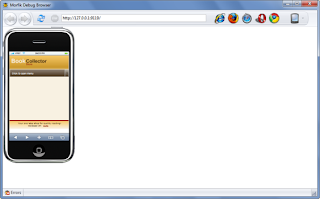 The selection is done automatically based on the device that is being used to access the application. In adding explicit support for mobile applications into the its development environment and framework Morfik went all the way in and added support for previewing applications as they will look in the iPhone and on the iPad. The Morfik debug browser now has a small button on the far right of its toolbar that allows the developer to choose from a list of devices and screen orientations. 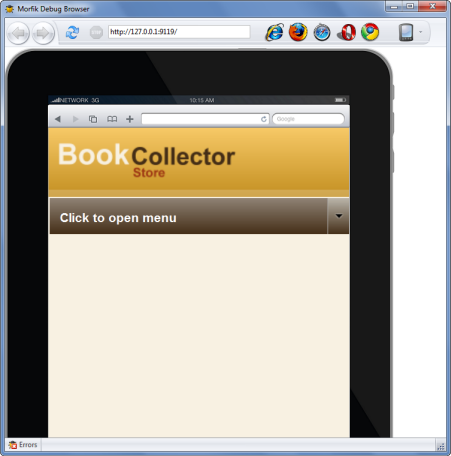 The following picture shows the BookCollector sample application loaded into the iPhone preview. The iPhone “version” of the application will contain only the pages you specify through links from the iPhone start page. The same is true for iPad versions of your applications, though you can choose to have more than one type of device using the same pages. The next picture shows the same application in preview mode, simulating its execution in an iPad in portrait display orientation. At this time, Morfik supports Apple’s line up of mobile products: iPhone, iPod Touch and iPad, though applications should work on other mobile devices that a fully functional browser. This generally means that applications should function okay on Android devices, as Google’s browser implementation is based on WebKit, just as mobile Safari. There can be no guarantee that the applications will look good on all Android devices as they all have different screen sizes and resolutions. Morfik 3 also introduce a pair of new controls: Menu Bar and Repeater. I’ll take a closer look at these controls and other Morfik 3 features in other follow up posts. This entry was posted in M3, Mobility, Visual Design. Bookmark the permalink.